Um, yeah, not gonna spend $900 on a dining table. It’s beautiful and I’m sure very well made but it’s just not in the cards for Brandi at this point in her life. She’s actually hoping to keep it under $200. The first place I looked, obviously, was Ikea. The pickings were slim. One option is to get the $200 Bjursta dining table in the birch effect and paint it white. Painting laminate can be tricky so I’d be sure to use a high adhesion primer and give it lots of time to cure. 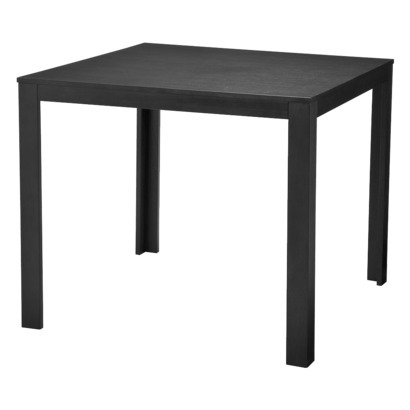 I have this table in black in my dining room and it’s held up great over the five years or so that we’ve owned it. Another idea is this melamine table, but the legs aren’t quite as chunky as the traditional Parsons-style emulated by Brandi’s dream table. I actually have this table in the 70″ size (which I guess Ikea doesn’t sell anymore?) and use it as a desk. I love it. Moving on from Ikea, Target has a square parsons dining table for only $99. It only comes in black so she’d have to paint it, and again I recommend primer and plenty of time to cure. Brandi’s dining room is on the petite side–from the floor plan she sent me of her condo it looks like the eating area is only about 7.5′ square. In a smaller space like this she could actually use a generously sized desk as an eating table. The description of this desk says it’s 65″ wide and 24″ deep–if that’s true then it’s definitely big enough to dine at. It’s already white and the price is just ridiculous–only fifty bucks. This one is more expensive at $160 and smaller–about four feet wide and two feet deep. But it has two drawers (perfect for stashing take out menus or rarely used serving utensils) and that classic Parsons look. This one from Home Decorators is really similar but about $40 more. And last but not least we have this $200 desk from The Container Store. It’s the same size as the two above but made of steel and melamine. And, of course, it’s not white. The best option for sturdy, inexpensive furniture is almost always to get it secondhand, but Parsons tables are timeless and thus rarely turn up for a steal (or at all here in the Deep South, where modern aesthetics are pretty uncommon). If you’re handy, you could try your hand at DIYing one using these free plans. If it were me, I’d probably go with that $50 desk from Target, though I’m not convinced that it’s actually 65″ long since it’s so inexpensive and there are no reviews or in-store models to verify that it’s not a mistake. I don’t know, what do y’all think? Are there any inexpensive parsons-style white dining tables that I missed in my search? Ooh..I like the overstock option..but alas, my AC had some repairs to be made, so I have to wait Thanks for all your hard work! I still think Ikea might have something. Besides the regular dining tables, the Office Furniture section might give you a top and leg combo that could work … and likely within budget. For instance, Linnmon table tops start at $35.99 and Borgfinn legs are $10 each. The other option at Ikea would be the Outdoor section. The Falster table is $175 and would be a very trendy choice. Something you’d see in the European blogs. Now there’s an idea! Thanks, Louise! What good ideas, Louise! I really like the Linnmon idea.